For the United States army officer, see Daniel Frank Craig. Craig achieved international fame when chosen as the sixth actor to play the role of Ian Fleming's British secret agent character James Bond in the film series, taking over from Pierce Brosnan in 2005. His debut film as Bond, Casino Royale, was released internationally in November 2006 and was highly acclaimed, earning him a BAFTA award nomination. Casino Royale became the highest-grossing in the series at the time. Quantum of Solace followed two years later. Craig's third Bond film, Skyfall, premiered in 2012 and is currently the highest-grossing film in the series and the 22nd-highest-grossing film of all time; it was also the highest-grossing film in the United Kingdom until 2015. Craig's fourth Bond film, Spectre, premiered in 2015. He also made a guest appearance as Bond in the opening ceremony of the London 2012 Olympic Games, alongside Queen Elizabeth II. His fifth Bond film, tentatively titled Bond 25, is scheduled for release on 8 April 2020. Since taking the role of Bond, Craig has continued to star in other films, including the fantasy film The Golden Compass (2007), World War II film Defiance (2008), science fiction western Cowboys & Aliens (2011), the English-language adaptation of Stieg Larsson's mystery thriller The Girl with the Dragon Tattoo (2011), and the heist film Logan Lucky (2017). Craig was born in Chester, Cheshire. His mother, Carol Olivia (née Williams), was an art teacher, and his father, Timothy John Wroughton Craig, was the landlord of two pubs, the Ring o' Bells in Frodsham, Cheshire, and the Boot Inn in Tarporley, Cheshire, having served as a midshipman in the Merchant Navy. Craig has Scottish, Welsh and distant French Huguenot ancestry. Huguenot minister Daniel Chamier is among his ancestors, as is Sir William Burnaby, 1st Baronet. Craig's middle name, Wroughton, comes from his great-great-grandmother, Grace Matilda Wroughton. Raised on the Wirral Peninsula, Craig attended primary school in Frodsham and Hoylake, Merseyside. Later, he attended Hilbre High School in West Kirby, Merseyside, along with his elder sister Lea (born 1965), after failing his eleven-plus exam. When his parents divorced, Craig and his sister lived with their mother, moving to Liverpool. Upon finishing his compulsory secondary school education at the age of 16, he briefly joined Calday Grange Grammar School as a sixth form student. He played rugby union for Hoylake RFC. Craig began acting in school plays at the age of six, and was introduced to serious acting by attending the Everyman Theatre in nearby Liverpool City Centre with his mother. At the age of 16, Craig was accepted into the National Youth Theatre, leaving school and moving to London, where he worked part-time in restaurants to finance his training. Later on, after multiple attempts at auditioning for drama schools, he was accepted at the Guildhall School of Music and Drama at the Barbican, where he graduated in 1991 after three years of study under Colin McCormack. Craig appeared in his first screen role in 1992, playing an Afrikaner in The Power of One. He then appeared as Joe in the Royal National Theatre's production of Tony Kushner's Angels in America in November 1993. Also in 1993, Craig was featured in two episodes of the American television shows Zorro and The Young Indiana Jones Chronicles, and British shows Heartbeat, Between the Lines, Drop the Dead Donkey and Sharpe's Eagle. Craig was featured in the poorly received Disney film A Kid in King Arthur's Court (1995). In 1996, Craig starred in the BBC drama serial Our Friends in the North as the troubled George 'Geordie' Peacock. Appearing alongside Christopher Eccleston, Gina McKee and Mark Strong, Craig's part in the series is considered his breakthrough role. In the same year, Craig guest starred in an episode of the HBO horror anthology series Tales from the Crypt and was featured in the BBC television film Saint-Ex. Craig gave a lead performance in the Franco-German drama Obsession in 1997, about a love triangle between Craig's character and a couple. Craig appeared in three films in 1998: the independent drama Love and Rage, the biographical drama Elizabeth, in which he played Jesuit priest John Ballard, who was executed for being involved in an attempt to assassinate Queen Elizabeth I of England in the Babington Plot, and the BBC television film Love Is the Devil: Study for a Portrait of Francis Bacon (1998), in which Craig played small-time thief George Dyer who becomes the lover and muse of painter Francis Bacon, who was portrayed by Derek Jacobi. The following year, Craig starred in a television drama called Shockers: The Visitor and as Sergeant Telford Winter in the independent war film The Trench, which takes place in the confines of the trenches in the First World War during the 48 hours leading up to the Battle of the Somme. Craig played a schizophrenic man who falls in with a woman (played Kelly Macdonald) after being discharged from psychiatric hospital in the drama Some Voices (2000). Also in 2000, Craig co-starred alongside Toni Collette in the dark comedy Hotel Splendide and was featured in I Dreamed of Africa, based on the life of Kuki Gallmann (played by Kim Basinger). Craig played a "tomb raider" and the romantic interest to Angelina Jolie's character Lara Croft in Lara Croft: Tomb Raider (2001), based on the video game series Tomb Raider. He later admitted to only accepting the role in the ill-received yet commercially successful film for the paycheque. In 2001, Craig also starred in the four-part Channel 4 drama Sword of Honour, based on the trilogy of novels of the same. Craig appeared in the anthology film Ten Minutes Older: The Cello (2002), starring in the segment "Addicted to the Stars", directed by Michael Radford. His second release of 2002 was Sam Mendes' crime film Road to Perdition with Tom Hanks and Paul Newman as Irish mobster Connor Rooney, the son of the crime organisation's boss, played by Newman. Craig portrayed German theoretical physicist Werner Heisenberg in the BBC television drama Copenhagen (2002), which depicts Heisenberg's involvement in the German nuclear weapon project during World War II. On stage, Craig starred opposite Michael Gambon in the original production of Caryl Churchill's play A Number from September to November 2002 at the Royal Court Theatre. Craig received a London Evening Standard Theatre Award for Best Actor nomination for his role as a man who is cloned twice by his father. Craig starred as poet Ted Hughes opposite Gwyneth Paltrow as Sylvia Plath in the biographical film Sylvia (2003), which depicts the romance between the two poets. In the same year, he appeared in The Mother as a man who engages in an affair with the much older mother (played by Anne Reid) of his lover and best friend. The crime thriller Layer Cake, directed by Matthew Vaughn, starred Craig as a London-based cocaine supplier known only as XXXX. Los Angeles Times writer praised Craig's "stunningly suave performance", while Roger Ebert thought he was "fascinating" in the film. Craig next starred as a man who becomes dangerously close with a stranger (played by Rhys Ifans) after witnessing a deadly accident together in Enduring Love (2004). Craig appeared in three theatrical films in 2005, all of which were supporting roles. His first release of the year, was the thriller The Jacket starring Adrien Brody and Keira Knightley. He then made a brief appearance in the Hungarian film Fateless as a United States Army Sergeant who takes a liking to a teenage boy who survives life in concentration camps. Craig's third and final role of the year was a South African driver who is a part of a covert Israeli government assassination mission against eleven Palestinians allegedly involved in the Munich massacre at the 1972 Summer Olympics. The film, Munich, directed by Steven Spielberg, starred Eric Bana as a member of the operation, a Mossad agent. Also in 2005, Craig starred in the BBC television film Archangel – based on Robert Harris' eponymous novel – as an English academic who stumbles upon a notebook believed to have belonged to Joseph Stalin. 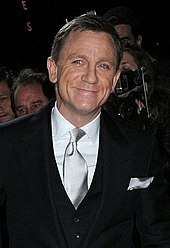 In 2005, Craig was contacted by Eon Productions to portray James Bond. He stated he "was aware of the challenges" of the Bond franchise, which he considered "a big machine that makes a lot of money". He aimed at bringing more "emotional depth" to the character. Born in 1968, Craig is the first actor to portray James Bond to have been born after the Bond series started and after the death of Ian Fleming, the novels' writer. The casting choice caused significant controversy. Throughout the entire production period, internet campaigns expressed their dissatisfaction and threatened to boycott the film in protest. 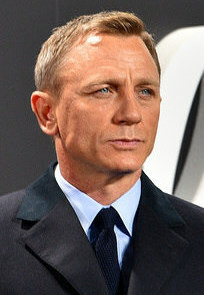 The 5-foot-10-inch (178 cm) blond Craig was not considered by some protesters to fit the tall, dark-haired Bond portrayed by the previous Bond actors, to which viewers had apparently become accustomed. Although the choice of Craig was controversial, numerous actors publicly voiced their support. Most notably four of the five actors who had previously portrayed Bond – Pierce Brosnan, Timothy Dalton, Sean Connery and Roger Moore – called his casting a good decision. George Lazenby has since voiced his approval of Craig also. Clive Owen, who had been linked to the role, also spoke in defence of Craig. The first film, Casino Royale, premiered on 14 November 2006, and grossed a total of US$594,239,066 worldwide, which made it the highest-grossing Bond film until the release of Skyfall. After the film was released, Craig's performance was highly acclaimed. As production of Casino Royale reached its conclusion, producers Michael G. Wilson and Barbara Broccoli announced that pre-production work had already begun on the 22nd Bond film. After several months of speculation as to the release date, Wilson and Broccoli officially announced on 20 July 2006 that the follow-up film, Quantum of Solace, was to be released on 7 November 2008, and that Craig would play Bond with an option for a third film. On 25 October 2007, MGM CEO Harry Sloan revealed at the Forbes Meet II Conference that Craig had signed on to make four more Bond films, through to Bond 25. Craig lent his voice and likeness as James Bond for both the Wii game GoldenEye 007, an enhanced remake of the 1997 game for the Nintendo 64, and James Bond 007: Blood Stone, an original game for Xbox 360, PlayStation 3, Nintendo DS, and Microsoft Windows. In addition to Casino Royale, Craig also appeared two more films in 2006: the drama Infamous as mass murderer Perry Edward Smith and as the voice of the lead character in the English-language version of the French animated film Renaissance. The Academy of Motion Picture Arts and Sciences extended a membership invitation to Craig in 2006. Craig starred opposite Nicole Kidman in the science fiction horror film The Invasion in 2007, the fourth film adaptation of the novel The Body Snatchers by Jack Finney. The film was met with a negative reception from critics, with Roger Ebert believing it to be the worst adaptation of Finney's novel. He portrayed Lord Asriel in The Golden Compass, the 2007 film adaptation of Philip Pullman's novel. Eva Green, who played Bond girl Vesper Lynd in Casino Royale, also starred in the film, although she did not appear in any scenes with Craig. In a stage version of the book, Asriel had previously been played by Timothy Dalton, one of Craig's predecessors in the role of James Bond. In March 2007, Craig made a cameo appearance as himself in a sketch with Catherine Tate who appeared in the guise of her character Elaine Figgis from The Catherine Tate Show. The sketch was made for the BBC Red Nose Day 2007 fundraising programme. In 2008, Craig, along with Quantum of Solace, starred in the drama Flashbacks of a Fool alongside Emilia Fox, as a washed-up Hollywood actor who reflects upon his life and what might have been had he stayed in England, after the death of his childhood best friend. In his final release of 2008, the war film Defiance, Craig starred as Tuvia Bielski, the leader of the Bielski partisans, fighting in the forests of Belarus during World War II, saving 1,200 people. He co-starred with Hugh Jackman in a limited engagement of the drama A Steady Rain, on Broadway, which played from 10 September through 6 December 2009 at the Schoenfeld Theatre. His performance received praise from the New York Times, with the reviewer writing "Mr. Craig, a highly reputable stage actor in London (“Angels in America,” “A Number”) before he became the screen's sixth James Bond, creates a more complete portrait as Joey." In August 2010, Craig was cast as crusading journalist Mikael Blomkvist in David Fincher's 2011 adaptation of Stieg Larsson's novel The Girl with the Dragon Tattoo. In 2011, he starred in Dream House, a psychological thriller directed by Jim Sheridan and co-starring Rachel Weisz, Naomi Watts and Marton Csokas. It garnered mostly negative reviews and low box office results. Craig co-starred with Harrison Ford and Olivia Wilde in Cowboys & Aliens, an American science fiction Western film, based on Scott Mitchell Rosenberg's 2006 graphic novel of the same name. Craig provided his voice to Steven Spielberg's animated film The Adventures of Tintin in 2011, playing the villainous pirate Ivan Ivanovitch Sakharine and his ancestor Red Rackham in a dual role. The planned 19 April 2010 release of Craig's third Bond film (the 23rd overall in the series) was delayed, because of financial troubles with MGM; the film, titled Skyfall, was eventually released on 23 October 2012, as part of the year-long celebration of the 50th anniversary of Dr. No. On 8 September 2012, Bond producers announced Craig had signed on for two future Bond films, meaning he would appear as 007 in at least five films, making him the third-longest-serving Bond after Roger Moore, who starred in seven Bond films, and Sean Connery who starred in six EON Bond films and one non-EON Bond film. Craig hosted the American late-night live television sketch comedy Saturday Night Live on 6 October 2012. He appeared in a sketch about "forgotten" Bond women, including Diane Keaton, Penny Marshall, Jodie Foster, Ellen DeGeneres, Lea Michele, and Molly Ringwald. He and his wife Weisz starred in a Broadway play titled Betrayal. It began performances in October 2013, and continued until January 2014. Despite mixed reviews, it grossed $17.5 million, becoming the second highest broadway play of 2013. Craig's fourth Bond film, Spectre, began filming in December 2014 and was released on 26 October 2015. His four Bond films released by Sony has earned a combined gross of $3.5 billion globally, after adjusting for inflation. Prior to the inaugural Invictus Games held in London in September 2014, Craig along with other entertainers and athletes read the poem "Invictus" in a promotional video. He made an uncredited cameo appearance as a Stormtrooper in the Star Wars sequel Star Wars: The Force Awakens in 2015. Craig appeared in a modern production of William Shakespeare's tragedy Othello at the Off-Broadway New York Theatre Workshop throughout late 2016 and early 2017. The production starred David Oyelowo as the titular character and Craig as the main antagonist, Iago. Diane Snyder of The Daily Telegraph praised his "chilling" portrayal of Iago in the play. In 2017, Craig co-starred in Steven Soderbergh's comedy Logan Lucky, about two brothers who pull off a heist during a NASCAR race. Craig starred alongside Halle Berry in the drama Kings set during the 1992 Los Angeles riots. The film premiered in September 2017, but has not yet received distribution. In April 2018, Daniel Craig confirmed to Associated Press that the untitled 25th James Bond film will be his next project, serving as his fifth and final performance as the eponymous character. The film was to be directed by Danny Boyle with a scheduled (North American) release date of 8 November 2019 and with earlier releases in the United Kingdom and overseas territories, but Boyle, citing "creative differences", later withdrew from its production. Craig has described his portrayal of Bond as an anti-hero: "The question I keep asking myself while playing the role is, 'Am I the good guy or just a bad guy who works for the good side?' Bond's role, after all, is that of an assassin when you come down to it. I have never played a role in which someone's dark side shouldn't be explored. I don't think it should be confusing by the end of the film, but during the film you should be questioning who he is." Craig has stated that his own favourite previous Bond actor is Sean Connery, but says, "I'd never copy somebody else. I would never do an impression of anybody else or try and improve on what they did. That would be a pointless exercise for me." His own favourite Bond film is From Russia with Love. On an episode of The South Bank Show, Connery divulged his thoughts on Craig's casting as Bond, whom he described as "fantastic, marvellous in the part". When told that Craig had taken particular note of his performances, Connery said that he was "flattered" and that Craig really gets the "danger element" to Bond's character. Craig has remarked that Bond is "...actually a misogynist... A lot of women are drawn to him chiefly because he embodies a certain kind of danger and never sticks around for too long." In 1992, Craig married actress Fiona Loudon, with whom he had a daughter, named Ella. The marriage ended in divorce in 1994. After his divorce, he was in a seven-year relationship with German actress Heike Makatsch, ending in 2004. He subsequently dated and was engaged to film producer Satsuki Mitchell from 2005 until 2010. Craig and actress Rachel Weisz had been friends for many years, and worked together on the movie Dream House. They began dating in December 2010 and married on 22 June 2011, in a private New York City ceremony, with four guests in attendance, including Craig's daughter and Weisz's son. On 1 September 2018, it was reported that they had welcomed their first child together, a daughter. In October 2008, Craig paid £4 million for an apartment in a converted old house in Primrose Hill near Regent's Park, London. He also has a house in Sunninghill outside Ascot. He is an avid fan of Premier League football club Liverpool F.C., as well as a rugby fan and former player, having travelled to Australia in 2013 to watch the British & Irish Lions tour. Craig has been reluctant to discuss his religious beliefs. During an interview about the apparently anti-religious message of the 2007 film The Golden Compass, in which he starred, he stated: "I've never been religious and I’m not a church-goer, but I do find religion fascinating because it has such a huge impact on our lives". Craig was opposed to the United Kingdom leaving the EU. In 2016, he was pictured wearing a 'vote Remain' t-shirt with the words "No man is an island. No country by itself" written across it in a picture tweeted on the Stronger IN account. Craig participated in the Broadway Cares/Equity Fights AIDS fundraising 8 December 2009, raising $1,549,953 in the 21st annual Gypsy of the Year competition, from six weeks of curtain appeals at their hit Broadway drama, A Steady Rain. He is involved with multiple charities including S.A.F.E. Kenya, which uses street theatre to address social issues. He is also involved with the Opportunity Network, which provides access to education for low-income students in New York. In 2011, he collaborated with Dame Judi Dench to highlight gender inequality for International Women's Day. In August 2014, he added his name to a letter to British broadcasters calling for better representation of ethnic minorities. In April 2015, the United Nations appointed Craig the first global advocate for the elimination of mines and explosive hazards. The role involves raising awareness for the UN Mine Action Service (UNMAS), and political and financial support for the cause. Former UN Secretary-General Ban Ki-moon told Craig: "You have been given a licence to kill, I'm now giving you a licence to save." In September 2015, Craig donated $47,000 to the Bernie Sanders presidential campaign. Drop the Dead Donkey Fixx Episode: "George and His Daughter"
The Young Indiana Jones Chronicles Schiller Episode: "Palestine, October 1917"
Between the Lines Joe Rance Episode: "New Order"
Heartbeat Peter Begg Episode: "A Chilly Reception"
Screen Two Lt. Guth Episode: "Genghis Cohn"
Tales from the Crypt Barry Episode: "Smoke Wrings"
1997 The Hunger Jerry Pritchard Episode: "Ménage à Trois"
2012 Saturday Night Live Himself (host) Episode: "Daniel Craig/Muse"
2012 Through Their Eyes Himself Produced by Omega and Orbis International. Documents Daniel Craig's visit to Mongolia with the Orbis medical team. ^ a b "Daniel Craig Biography: Film Actor, Theater Actor (1968–)". Biography.com (FYI / A&E Networks. Archived from the original on 6 September 2015. Retrieved 8 October 2015. ^ Hoyle, Ben (15 November 2006). "'Best Bond ever' vanquishes his greatest foe – the critics". The Times. UK. Retrieved 15 November 2006. ^ Gant, Charles (5 December 2012). "Skyfall windfall is UK box office's biggest ever". The Guardian. London. Archived from the original on 31 January 2013. Retrieved 2 October 2015. ^ McNary, Dave (15 February 2019). "Bond 25 Moved Back Two Months to April 2020". Variety. Retrieved 15 February 2019. ^ a b "Daniel Craig – Biography of the James Bond Star". Chester Chronicle. 23 September 2010. Archived from the original on 5 August 2012. Retrieved 13 July 2013. ^ Holmes, David. "Chester secures advance screening of new Bond film Quantum of Solace". Chester Chronicle. Retrieved 12 September 2010. ^ "People Profile, Daniel Craig". Cigar Aficionado. 30 March 2009. Archived from the original on 8 October 2009. Retrieved 12 September 2010. ^ "Je m'appelle Bond... James Bond". Genealogy Reviews. Retrieved 1 May 2015. ^ Marshall, Sarah (2008). Daniel Craig: The Biography. John Blake Publishing Ltd. ISBN 978-1-84454-604-6. ^ "Hoylake Holy Trinity – Homepage". Hoylakeholytrinity.wirral.sch.uk. Retrieved 13 July 2013. ^ "Biography". Chester Chronicle. 25 January 2011. Archived from the original on 5 August 2012. Retrieved 25 January 2011. ^ "Daniel Craig – Biography". talktalk.co.uk. ^ "Royal seal of approval for Daniel Craig's 007 Skyfall premiere". Wirralglobe.co.uk. Retrieved 13 July 2013. ^ Slater, Matt (17 July 2006). "A-Hoylake!". BBC News. Retrieved 29 December 2007. ^ "Colin McCormack". The Stage. 19 July 2004. ^ Eames, Tom (5 March 2016). "15 big-name stars you forgot appeared in The Young Indiana Jones Chronicles: Daniel Craig, Elizabeth Hurley and more". Digital Spy. Retrieved 16 February 2018. ^ "Bond star in Heartbeat". Whitby Gazette. 15 August 2007. Retrieved 3 August 2012. ^ "Daniel Craig: career in pictures". The Daily Telegraph. 13 March 2015. Retrieved 16 February 2018. ^ Nashawaty, Chris (2 December 2011). "24 Stars' Worst Movies". Entertainment Weekly. Retrieved 16 February 2018. ^ Raphael, Amy (18 September 2010). "Our Friends In The North made a star of Daniel Craig but almost wasn't made". The Guardian. Retrieved 16 February 2018. ^ a b "Daniel Craig: Our Friend in MI6". BBC News. 14 October 2005. Retrieved 27 December 2007. ^ Seddon, Gem (29 October 2015). "Here's a 'Tales from the Crypt' That Stars Daniel Craig". Inverse. Retrieved 16 February 2018. ^ "Saint-Ex (1996)". British Film Institute. Retrieved 16 February 2018. ^ Lazos, Tracey (10 March 2009). "Obsession". The National. Retrieved 16 February 2018. ^ Cockrell, Eddie (4 October 1999). "Love & Rage". Variety. Retrieved 16 February 2018. ^ Robey, Tim (21 October 2015). "Beyond Bond: Daniel Craig's best roles". The Daily Telegraph. Retrieved 16 February 2018. ^ Rooney, David (25 May 1998). "Love Is the Devil — Study for a Portrait of Francis Bacon". Variety. Retrieved 16 February 2018. ^ Holden, Stephen (22 November 2000). "Idealism Is a Casualty In War Zone". The New York Times. Retrieved 16 February 2018. ^ Bradshaw, Peter (25 August 2000). "Some Voices". The Guardian. Retrieved 16 February 2018. ^ Thomson, Michael (19 September 2000). "Hotel Splendide (2000)". BBC. Retrieved 16 February 2018. ^ Beresford, Jack (5 January 2018). "16 Things Fans Never Knew About Angelina Jolie's Disastrous Tomb Raider Movies". Screen Rant. Retrieved 16 February 2018. ^ Morris, Mark (2 January 2001). "Declaration of Waugh". The Guardian. Retrieved 16 February 2018. ^ "Ten Minutes Older: The Cello". The Times. 11 December 2003. Retrieved 16 February 2018. ^ Ebert, Roger (12 July 2002). "Road to Perdition". Chicago Sun-Times. Retrieved 16 February 2018. ^ Vallely, Paul (14 October 2005). "Daniel Craig: Rough cut". The Independent. Retrieved 16 February 2018. ^ Gardner, Lyn (27 September 2002). "A Number". The Guardian. Retrieved 22 February 2018. ^ "Evening Standard Theatre Awards 2002 shortlist". London Evening Standard. 13 November 2002. Retrieved 22 February 2018. ^ Scott, A.O. (17 October 2003). "A Poet's Death, A Death's Poetry". The New York Times. Retrieved 16 February 2018. ^ Bradshaw, Peter (14 November 2003). "Film of the week: The Mother". The Guardian. Retrieved 16 February 2018. ^ Crust, Kevin (13 May 2005). "Cast, writing keep 'Layer Cake' fresh". Los Angeles Times. Retrieved 16 February 2018. ^ Ebert, Roger (19 May 2005). "Layer Cake". Chicago Sun-Times. Retrieved 16 February 2018. ^ Bradshaw, Peter (26 November 2004). "Enduring Love". The Guardian. Retrieved 16 February 2018. ^ Schager, Nick (3 March 2005). "The Jacket". Slant Magazine. Retrieved 16 February 2018. ^ Bradshaw, Peter (5 May 2006). "Fateless". The Guardian. Retrieved 16 February 2018. ^ Ascherson, Neal (15 January 2006). "A master and the myths of Munich". The Guardian. Retrieved 16 February 2018. ^ Falk, Quentin (18 March 2005). "The don who came in from the cold". The Daily Telegraph. Retrieved 22 February 2018. ^ "Anti-Bond protests". Moono. Archived from the original on 19 March 2007. Retrieved 3 April 2007. ^ La Monica, Paul R. (6 November 2006). "Blond, James Blond". CNN. Retrieved 2 April 2007. ^ Medley, Mark (14 September 2006). "Pierce Brosnan answers". The Globe and Mail. Toronto. Retrieved 18 September 2017. ^ "The George Lazenby of 007s: A Conversation with George Lazenby". popcultureaddict.com. Archived from the original on 13 October 2012. Retrieved 3 August 2012. ^ "Owen backs 'proper actor' as Bond". BBC News. 19 September 2006. Retrieved 19 September 2006. ^ "Casino Royale box office results". Box Office Mojo. Retrieved 4 January 2008. ^ Lyall, Sarah (17 November 2006). "New Bond". The New York Times. Retrieved 25 January 2011. ^ "New Bond film title is confirmed". BBC News. 24 January 2008. Retrieved 24 January 2008. ^ "Campbell and Broccoli explain the shift from Brosnan to Craig, hints for Bond 22 plotlines". MI6-HQ.com. 18 November 2006. ^ Bond, Paul (26 October 2007). "Sloan sees hope in talks". The Hollywood Reporter. Archived from the original on 28 October 2007. Retrieved 3 November 2007. ^ Saltzman, Marc (13 November 2010). "New generation of gamers play Bond in 'Goldeneye'". USA Today. Retrieved 20 August 2011. ^ Gritten, David (5 January 2007). "You wait years for a good Capote film, then two come along at once". The Daily Telegraph. Retrieved 16 February 2018. ^ Holden, Stephen (22 September 2006). "Even in a Place Like Paris, It's Not Good to Live Forever". The New York Times. Retrieved 16 February 2018. ^ "Academy Invites 115 to Become Members" (Press release). Academy of Motion Picture Arts and Sciences. 18 June 2007. Archived from the original on 24 December 2007. ^ Ebert, Roger (16 August 2007). "The Invasion". Chicago Sun-Times. Retrieved 16 February 2018. ^ "Craig lands role in Pullman film". BBC News. 18 August 2006. Retrieved 19 August 2006. ^ "Michael to be in Tate sketch show". BBC News. 17 July 2007. Retrieved 9 September 2007. ^ "Voices on Antisemtisim interview with Daneil Craig". United States Holocaust Memorial Museum. 12 March 2009. Archived from the original on 5 May 2012. ^ Brantley, Ben (29 September 2009). "Daniel Craig and Hugh Jackman on a Sentimental Journey". The New York Times. ISSN 0362-4331. Retrieved 13 November 2015. ^ Fleming, Mike (26 July 2010). "Daniel Craig Closes Deal For 'The Girl with the Dragon Tattoo'". Deadline Hollywood. New York. Retrieved 26 November 2006. ^ "Rachel Weisz, Daniel Craig And Naomi Watts To Star In 'Dream House'". FilmoFilia. Retrieved 11 February 2010. ^ Ehrenreich, Ben (11 November 2007). "PHENOMENON; Comic Genius?". The New York Times. Retrieved 13 July 2013. ^ "It Books and Platinum Studios Announce "Cowboys & Aliens" Graphic Novel Paperback Edition on Stands 28 June 2011". Marketwire.com. 1 June 2011. Retrieved 13 July 2013. ^ Reynolds, Simon (17 October 2011). "'Adventures of Tintin': 10 teasers for Steven Spielberg's blockbuster". Digital Spy. Retrieved 20 February 2018. ^ Taylor, Sophie (20 April 2010). "Daniel Craig's Bond film put on hold indefinitely". The First Post. Retrieved 12 September 2010. ^ "Daniel Craig signs up for two more Bond movies". New York Post. 8 September 2012. Retrieved 13 July 2013. ^ a b "Daniel Craig to play James Bond in at least two more films". The Guardian. Manchester. 30 June 2015. ^ "Daniel Craig hosts 'Saturday Night Live,' spoofs 'Bond'". ontheredcarpet.com. 7 October 2012. Retrieved 8 October 2012. ^ "Daniel Craig Heads Back To Broadway With 'Betrayal'". All Things Considered. 18 September 2013. Retrieved 26 September 2013. ^ Cox, Gordon (5 April 2013). "Daniel Craig, Rachel Weisz to Star in Broadway 'Betrayal'". Variety. Retrieved 26 September 2013. ^ "Daniel Craig and Rachel Weisz claim huge success with Betrayal on Broadway". The Guardian. 7 January 2014. Retrieved 16 January 2014. ^ Barnes, Brooks (20 April 2017). "Five Studios' Mission: Winning the Distribution Rights to James Bond". The New York Times. Retrieved 21 April 2017. ^ "Daniel Craig, Tom Hardy & Will.i.am recite 'Invictus' to support the Invictus Games". YouTube. 29 May 2014. Retrieved 9 May 2016. ^ "When are Prince Harry's Invictus Games and what are they?". The Daily Telegraph. 8 May 2016. Retrieved 9 May 2016. ^ a b Lee, Chris (17 December 2015). "Daniel Craig's Star Wars: The Force Awakens cameo revealed". Entertainment Weekly. Retrieved 17 December 2015. ^ a b Snyder, Diane (13 December 2016). "Othello, New York Theatre Workshop, review: 'Daniel Craig chills the blood, David Oyelowo arouses the passions'". The Daily Telegraph. Retrieved 1 March 2018. ^ Busch, Anita (26 May 2016). "Daniel Craig And Katherine Heigl Finalizing Deals To Join Steven Soderbergh's 'Logan Lucky' As James Bond News Surfaces". Deadline Hollywood. Retrieved 8 January 2017. ^ Bradshaw, Peter (14 September 2017). "Kings review – Halle Berry and Daniel Craig fail to ignite baffling LA riots drama". The Guardian. Retrieved 20 February 2018. ^ Couch, Aaron (21 August 2018). "Danny Boyle Exits Next James Bond Film as Director". The Hollywood Reporter. Retrieved 26 August 2018. ^ Sessums, Kevin (26 October 2008). "The Man Who Loves Being Bad". Parade. Retrieved 27 October 2008. ^ "Daniel Craig". Monsters and Critics. 25 January 2011. Archived from the original on 11 April 2011. ^ "In One Quote, Daniel Craig Just Slammed Hollywood's Sexist Aging Double Standard". Mic. Retrieved 13 November 2015. ^ "Daniel Craig". People. 22 October 2012. Archived from the original on 31 January 2009. Retrieved 22 October 2012. ^ Webster, Ben (16 October 2005). "Heike". The Sunday Times. London. ^ "Nicole Kidman & Daniel Craig". W. Archived from the original on 14 May 2014. Retrieved 19 May 2014. ^ "Daniel Craig and Rachel Weisz get married". The Guardian. London. 26 June 2011. Retrieved 13 October 2012. ^ "Daniel Craig and Rachel Weisz say 'I Do' in a secret wedding!". BeautyMania.biz. Retrieved 25 June 2011. ^ Zakarin, Jordan (25 June 2011). "Rachel Weisz, Daniel Craig Get Married: Actress, Actor Wed In Secret Ceremony". The Huffington Post. ^ "Daniel Craig and Rachel Weisz welcome first child together". The Independent. 1 September 2018. ^ Leach, Ben (12 October 2008). "James Bond actor Daniel Craig buys £4 million home in area fit for a spy". The Daily Telegraph. UK. Retrieved 25 October 2008. ^ "James Bond star Daniel Craig enjoys Liverpool FC victory over Newcastle". Liverpool Echo. 4 May 2009. Retrieved 7 November 2012. ^ Fulton, Rick (28 November 2007). "Daniel Craig: My New Movie Is Not Anti-Religion". Daily Record. Glasgow. Retrieved 18 September 2017. ^ "Broadway Cares". Broadway Cares. 9 February 2010. Retrieved 6 September 2010. ^ "Clearing the road for Daniel Craig". SafeKenya.org. 9 May 2016. ^ "The Opportunity Network's 2016 Night of Opportunity Gala". Retrieved 12 April 2016. ^ Addley, Esther (7 March 2011). "James Bond video for international women's day shows 007's feminine side". The Guardian. ^ "Stars Write To Broadcasters For Diversity". Look to the Stars. 21 August 2014. ^ a b "Bond actor Daniel Craig's new 'licence to save' role" (14 April 2015). BBC News. 16 April 2015. ^ Richardson, Bradford (10 September 2015). "Bond actor donates $47,000 to Sanders PAC". The Hill. ^ Hidalgo, Pablo (3 July 2016). "Yeah, same with Infinity". @pablohidalgo. Retrieved 7 July 2017. ^ "China's Bliss Media, Maven Pictures to Finance Halle Berry's L.A. Riots Movie". Variety. 16 December 2016. Retrieved 3 January 2017. ^ "Imdb page for 'Comrade Detective'". 29 July 2017. ^ "OMEGA Watches: Orbis". www.omegawatches.com. Retrieved 6 June 2017. Marshall, Sarah (2007). Daniel Craig: The Biography. John Blake Publishing. ISBN 978-1-84454-454-7. O'Brien, Daniel (2007). Daniel Craig – Ultimate Professional. Reynolds & Hearn Ltd. ISBN 978-1-905287-44-4. Ogle, Tina (2009). Daniel Craig: The Illustrated Biography. Carlton Books. ISBN 978-1-84732-266-1. Wikimedia Commons has media related to Daniel Craig.